Dane is a west coaster who is relatively young in his track and field career. Raised in Corner Brook, NL, Dane spent his developing years playing a variety of sports; he became acquainted with the world of Athletics in 2011, just two years before he participated in Canada Games 2013 in shot put, javelin, and discus. Since then, Dane has been working as a fitness professional and currently coaches a diverse clientele and leads group classes at a local conditioning centre. 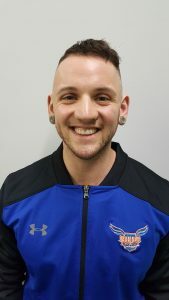 From his professional development, Dane has returned to Athletics as a coach who is certified in sport nutrition, myofascial compression techniques, suspension training, and movement screening. Dane has worked with various styles of athletes competing in local to international levels of competition. He is passionate about optimizing performance and spends much of his free time reading up on emerging information related to strength and conditioning. Dane is grateful to have the opportunity to broaden his coaching skills while working with the athletes at PGTFC.